Most of us think primarily in terms of either miles or kilometers, and converting from one to the other takes a bit of mental power that, personally, I think could be put to better use. We've heard the same from our users, so this week we've added the ability to view your driving directions in either miles or kilometers, no matter which part of the world you're in. 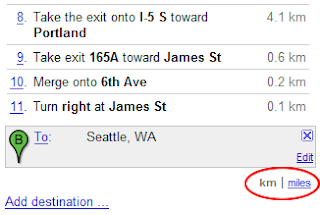 Just click the km or miles link below the directions if you want to switch your units, and hit the road.